Acquisition finance can be required if you are acquiring a business, in order to pay the purchase price. The acquisition may be structured in a number of different ways. The whole of the business may be acquired e.g. by purchasing the shares of an existing company, which effectively means that the buyer acquires all the assets and the liabilities of the target company. Alternatively, the buyer may only purchase the assets, or specified assets of a business, for which consideration is passed. The structure of the consideration may also vary. In some cases it may be a cash consideration, which may be paid entirely up front, or partly deferred over time. This deferred consideration may be agreed in order to protect the purchaser and hence can be contingent upon certain conditions being satisfied before it is paid. It can also be a way of helping the buyer cope with the liquidity requirements of meeting the full purchase price. The consideration may also be in a form other than cash, for example shares in the acquiring company (either in part or in full). Agreeing the terms of a purchase can take an extended period of time and a great deal of negotiation. The seller is always looking to receive a premium for their assets and the buyer is always seeking a keen price. There can also be extensive involvement of lawyers in order to produce a purchase agreement that is acceptable to all parties. In some cases, a business can be bought out by its existing management. This is referred to as a "management buyout", or MBO. If the team are not currently managing the target business, it can be referred to as a "management buy in", or MBI. With a small business purchase, it often involves a cash payment, perhaps with some deferred element over time. In some cases the existing owners may be retiring, or looking to exit the business for some other reason. It can be common for them to be retained in a consultancy capacity for a specified period of time, but this is not always the case. We have been involved with a number of cases where invoice finance has been used in order to meet the acquisition price of a purchase. 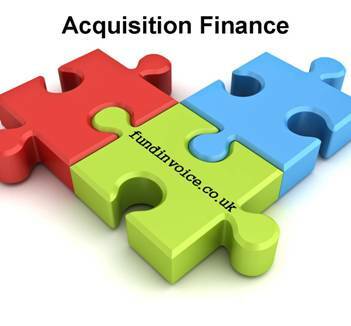 There is a way of using invoice finance to fund an acquisition. This could be with funding against your own business' sales ledger, in order to meet the price of acquiring another business. It can also be by way of funding against the book debts of the target company, which can be used to secure the funding in order to make the purchase. Some financiers are willing to make significant overpayments e.g. 100% against the book debts initially, in order to enable an acquisition to be completed. This level of prepayment may be gradually traded down over time, to a more normal level. This method of structuring the funding can significantly increase your liquidity, and enable purchases that could not be considered otherwise. Some businesses finance multiple acquisitions in this way. If you are looking at a potential acquisition please speak to Sean on: 03330 113622, about how we can help you raise the purchase price through acquisition finance.